Doug Casey: Domestically, I’d say the continual and accelerating loss of freedom, compounded by the prospect of what I suspect will be the biggest financial/economic crisis of modern times. What might that crisis be like? That’s unpredictable, although the odds are it will be unlike any others that are still fresh in people’s memories, simply because people tend to be most prepared for the things that have most recently scared them. The big problems usually come from an unexpected quarter, and/or at an unexpected time. Like the monetary crisis of 1998, that materialized in Thailand. That said, the question remains of where to look. It could come from outside American borders, in the form of war. War is perhaps the worst thing that can happen, not only for the destruction it will cause in itself, but because it will immensely exacerbate America’s domestic problems. As Bourne famously said, “War is the health of the State.” Certainly, the US government is actively provoking other governments in a score of places around the world. The next war could be serious, not just a sports war, like those in Iraq and Afghanistan. 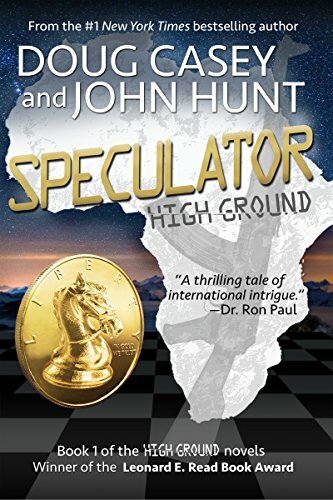 Speculator (High Groun... Doug Casey, John Hunt Check Amazon for Pricing. Doug Casey: If the economy goes off of the deep end over the next year—and I think it will—the US government is going to be running much bigger deficits. Spending is going to go up for welfare. Medicare, Medicaid, Social Security—that’s already about two-thirds of the US government’s budget. Military spending is also going up. All that is going to go up, regardless of who wins the election on November 8. But, on the other hand, the average guy—and for that matter, most businesses—aren’t borrowing money now. They’re too afraid. They don’t want to be in debt. The question is: As this comes to a real climax, are we going to have something resembling a runaway inflation in the dollar? Or are we going to have a massive credit collapse, which could be caused by defaults on bonds, house mortgages, student loans, or auto loans? I’m not sure which is going to happen. I mean, you buy a car now in the US, it costs you what a house did a couple generations ago. It all floats on a sea of debt. I’m just betting on financial chaos. That is the safe bet. Both candidates, Trump and Clinton, are disastrous. To me, it’s a sign of how degraded the US has become. About a year ago, they gave us a choice between Hillary, the wife of a previous president, pretty much playing the role of Argentina’s Evita, Juan Peron’s brassy wife. And Jeb Bush, the brother of one previous president and the son of another. The US has gone so far downhill that we can only choose which family dynasty we prefer to rule. If only a Kennedy, a Roosevelt, or a Rockefeller could be thrown into the mix as well… Maybe next time. Although I think we’re due for a general or two. Elections are, quite frankly, meaningless. These two corrupt parties, the Republicrats, and the Demopublicans, run by political hacks and funded by interest groups, simply appoint the people that they want and then present the American people with the illusion of a choice. The people who run these parties have become increasingly bold and arrogant. They’re absolutely horrible creatures, the same types that used to thrive in the Soviet Union. Americans should be ashamed of themselves for treating them with any respect at all. However, if forced to choose between the two candidates, I would definitely go for Trump, simply because he’s something of an outsider. The media, Hollywood, academia, and the Establishment hate him. And I believe he hates them. If elected, he will likely overturn a lot of apple carts in Washington and break a lot of rice bowls of people who live off the Deep State. That would be an excellent thing. It’s also possible he would retract most of Obama’s Executive Orders, and fire a bunch of supernumeraries. But he might replace them with a bunch of his own. However, it’s clear Trump has all kinds of dangerous authoritarian tendencies—don’t forget his endorsement of torture and the killing of families of accused terrorists as a policy. He also has all kinds of really silly and destructive economic notions—he appears to think he can cut “deals” with foreign governments. That has nothing to do with the concept of free trade. He’s threatened punitive tariffs, something that would immensely aggravate The Greater Depression. Worse, since as a businessman he’s associated with the free market—unfortunately, and incorrectly—capitalism will wind up being blamed for this depression as well as a result. Unfortunately, Trump is no libertarian—but neither is the dim-bulb candidate of the Libertarian Party. That said Trump is a lot better than Hillary—this is no time for a corrupt, hostile, elderly, debilitated, mildly demented Statist to become president. So, sure, I’d prefer Trump. Am I going to vote for him? I don’t believe in being complicit in a criminal act, so I don’t vote. Voting compromises your privacy. It gets your name in yet another government computer database. Voting encourages politicians. A vote against one candidate—a major, and quite understandable, the reason why most people vote—is always interpreted as a vote for his opponent. And even though you may be voting for the lesser of two evils, the lesser of two evils is still evil. It amounts to giving the candidate a tacit mandate to impose his will on society. Doug Casey: The Libertarian Party once had a claim to being the party of principle, back in the days when people like John Hospers, Harry Browne, and Ron Paul were their candidates. Then they for some reason put forward the empty suit Bob Barr, an ex-Congressman. It appears that the Libertarian Party has been captured by the Republicans, which is surprisingly clever on the Republicans’ part. Now they have two parties that are registered in all 50 states. It’s kind of a backup system to the regular Republican Party. They’ll need a backup since the old GOP is a dead duck. Regarding Gary Johnson, I don’t know what his philosophical beliefs, if any, are. I suspect neither, does he. The only thing we really know is that he wants to see pot legalized on a national scale. Well, bravo. I’m all for that, even though I’m not a toker. It’s a step in the right direction toward dismantling the insane War on Some Drugs. But does he have any other libertarian tendencies? He doesn’t seem to even have a grasp of the basic principles… although he seems better than the average politician. But that’s not saying much. One thing you’ve got to say about the Democratic Party is that, while their ideas are destructive and evil, at least they’re honest about them. Democrats make no bones about being the party of socialism, and they naturally attract the envy-driven, the class warriors, the politically correct, the cultural Marxists, the race baiters, the gender Nazis, and the like. The Democratic Party is beyond redemption. It needs to be flushed. It has zero redeeming value. I’m very pleased that I can watch all this nonsense on a widescreen in a coffee shop in Argentina and not be very adversely affected by it. Argentina, incidentally, is now going the right way from many points of view. It’s dangerous to stay rooted in one place when the natives get restless. Ask Russians in the 20’s, Germans in the 30’s, any European in the 40’s, Chinese in the 50’s, Cubans in the 60’s, Vietnamese in the 70’s, Rhodesians in the 80’s—or Venezuelans today. And that’s just an incomplete list off the top of my head. It’s especially risky if you have some assets during real economic upset, or ideas that aren’t mainstream when there’s real political turbulence. Doug Casey: It’s amazing, and disturbing, that most of the young people in the US support Bernie, an avowed socialist, whose ideas are, if anything, worse than Hillary’s. But it just shows how unhappy young people are with the status quo. Justifiably unhappy. Bernie and Trump hit the same nerve—they sensed that we’re on the edge of a revolution in this country. We really are. The situation is not unlike that before the War Between the States, very unstable. Of course, it seemed like we could have had a civil war back in the late 60’s and early 70’s when there were not just a few, but thousands of bombings. Not just little riots, like in Ferguson and Baltimore, but conflagrations like in Watts, DC, and Detroit, where the National Guard was raking the ghetto with .50 cals. But this time in the US it could turn into a real civil war. I don’t know what form it would take, but a lot of things could be really tough going: economically, financially, politically, socially, militarily. Most important, there’s a cultural divide that’s arisen in the US. I don’t think most people are even aware of what is going on. When you walk outside, the sun is shining. Children are still playing. You can go down to the Wal-Mart and buy cheap goods. Everything looks pretty good on the surface, despite the fact everyone’s credit card is maxed out. But I think it’s all a hologram that’s about to be exposed. So, hold on to your hat. Previous article by Nick Giambruno: Has World War 3 Already Started?